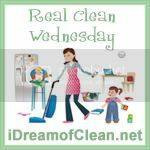 iDreamofClean will be hosting a link up called Real Clean Wednesday and I’d love it if you’d join in! One of the best things about blogging is the sense of community it brings. Each of us has something unique to offer so Real Clean Wednesday should give us an outlet to share with others. By linking up you’ll be able to spread your knowledge and hopefully receive visitors and comments from people you may not normally receive. The best perk for me is that I’ll get to know more about you! I can’t wait! Share a cleaning tip or trick. Talk about a cleaning success or failure you’ve had recently. Write a post or add one you’ve already written where you share a cleaning tip or trick, ask a cleaning question, talk about a cleaning success or failure you’ve had recently or just brag on your little ones for helping around the house-any reason to talk about our kiddos is a good one, right?! You can even follow #RealCleanWed on Twitter for updates! Count me in for Wednesday’s linky. Great! I’m excited to see what you’ll share! I will be following you there as well. Thanks! .-= Danette Lykins´s last blog ..Easter is Almost Here! =-.